Alexander de Seversky, a Russian immigrant to the US, formed Seversky Aviation Corporation in 1931 and one of his early projects was the SEV-3 amphibian which later shed its floats for landing gear to become the BT-8 trainer. When the US Army Air Corps issued a requirement for a single-seat fighter in 1935, Seversky submitted another outgrowth of the SEV to fly against the Curtiss Model 75. One of the problems of aircraft development in those days was that engines that were adopted for their specifications rarely performed up to those specifications and many of Seversky's designs were deemed underpowered. When the USAAC delayed the fly-off, Seversky's team changed engines to the Pratt & Whitney R1830 Twin Wasp. While that engine also failed to operate at specified horsepower, the Seversky prototype won the fly-off and production of the P-35 began. The P-35 was the first single-seat fighter to feature retractable landing gear, all-metal airframe, and a fully enclosed cockpit together in one airframe. The P-35 also featured a 'wet wing', where the skin of the wing doubled as part of the fuel cell to save weight. As you might imagine, these early wet wing designs had serious problems with leaks. Seversky delivered 76 of the contracted 77 airframes to the USAAC in about two years from contract award, with the 77th airframe held over to develop the XP-41. When the USAAC wanted more single-seat fighters, they acquired the Curtiss P-36 Hawk due to the slow pace of Seversky's production line and their sales of aircraft to the Japanese Navy. 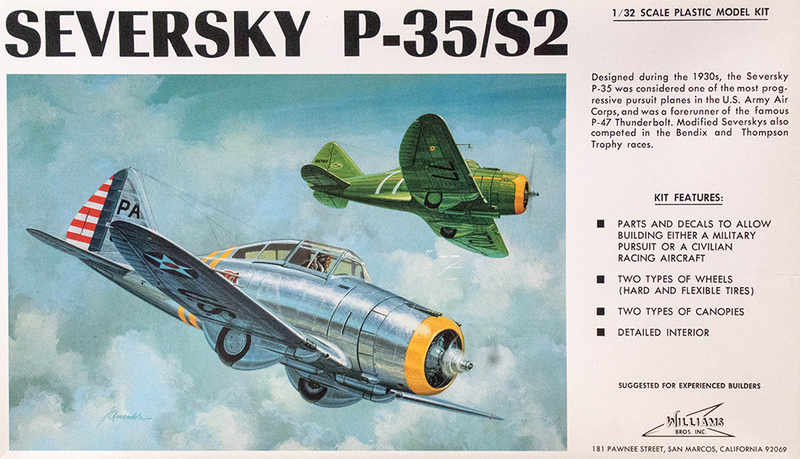 de Seversky continued to sell the P-35 to other nations while the USAAC had moved on to the P-43 Lancer. By 1940, de Seversky had been forced out of the company, which had been renamed Republic by the board of directors, and that company would go on to produce the rugged P-47 Thunderbolt during World War II. Despite being deemed obsolete shortly after its introduction into the USAAC, the P-35 would nonetheless serve through the first days of World War II though not a match against the Japanese A6M Zero. The Swedish Air Force purchased the P-35, designated as J-9, but only a portion were delivered before the US imposed an export embargo on aircraft not going to Britain in the months before it entered World War II. The aircraft that were supposed to go to Sweden after the embargo were stored at the Republic factory until requisitioned into USAAC service as the P-35A. Those aircraft that did reach Sweden would serve throughout World War II before being retired in 1952. The Williams Brothers first released this kit of the P-35 in 1/32 scale back in the early 1970s and has been reissued a few times over the decades. 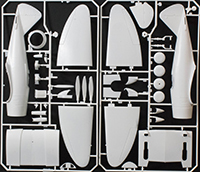 The kit is molded in white styrene and presented on four parts trees plus one tree of clear parts and one pair of rubber (vinyl) tires. The kit features a nicely detailed radial engine while the remainder of the kit offers basic details. You'll note in the parts images that the parts have a little mold flash that will need to be carefully cleaned up. On the front of the box, it claims that this kit has a detailed interior. If a few styrene bits constitute detail, then they are correct. If you're expecting a representative cockpit of the P-35 in this scale (as you should), then no, we'll be doing some scratchbuilding. Any resemblance that the raised exterior surface details have to reality are strictly coincidental. Plan on sanding/buffing the surface smooth and add the panel lines and rivet details to your preferences. The cowl is molded integral to the fuselage so the representation of cowl flaps is not done very well. 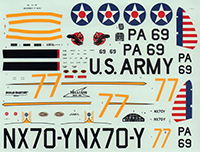 These can be scribed if you're happy with closed cowl flaps or the cowling can be removed and proper cowl flaps added from styrene. If you opt for the latter, you'll also need to add a firewall and engine mounts to the task list. The one thing Williams Brothers kits did well were the beautiful radial engine kits that are included and only need ignition wiring to complete the job. This kit any many others in the Williams Brothers line are still in production. What is really nice is that the retail price remains relatively low unlike the old reissues we see from other brands. While the P-35 was usually bare metal in the 1930s, it did receive olive drab over gray camouflage as the war drew near and some aircraft were deployed to the South Pacific. Williams Brothers provides the basics for a nice kit in this box, just how detailed the resulting model will be is up to you. There are some good resources 'out there' to help you along including this nice look into the cockpit of the aircraft on display at the National Museum of the USAF. If you're looking for a nice project that won't break the bank, consider this gem for your next undertaking.